By 1937, the earliest surviving membership list reveals that the first four ladies had been joined by sixteen others to honor the “artistry and spirit” of former times. These early Antiquarians were women whose talents and credentials were impressive. The plucky founding group had also acquired a clubhouse. 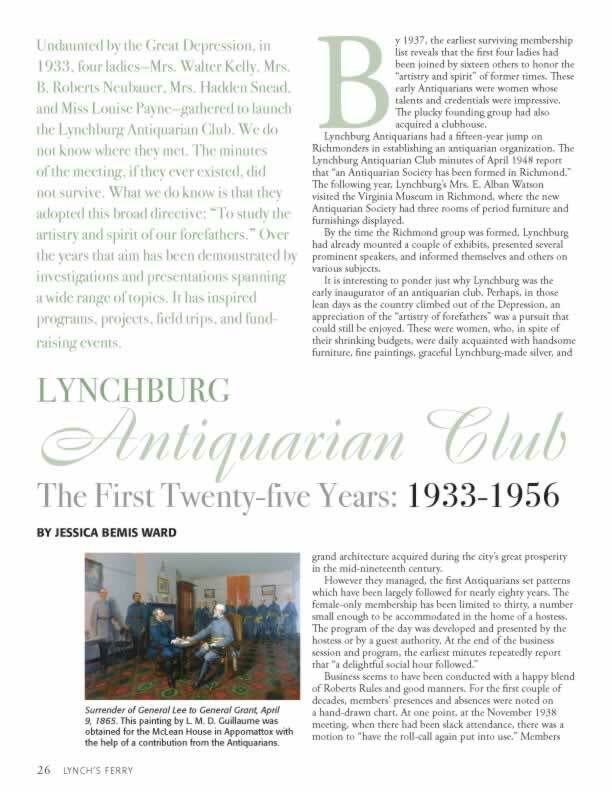 Lynchburg Antiquarians had a fifteen-year jump on Richmonders in establishing an antiquarian organization. The Lynchburg Antiquarian Club minutes of April 1948 report that “an Antiquarian Society has been formed in Richmond.” The following year, Lynchburg’s Mrs. E. Alban Watson visited the Virginia Museum in Richmond, where the new Antiquarian Society had three rooms of period furniture and furnishings displayed. By the time the Richmond group was formed, Lynchburg had already mounted a couple of exhibits, presented several prominent speakers, and informed themselves and others on various subjects. Jessica Ward, an Arkansan who came to Virginia to attend Sweet Briar, has lived in Lynchburg for more than thirty years. Before that, she and her husband, Peter, lived in Richmond and Washington.